Rishikesh ist eine der heiligsten Städte der Welt, ein spiritueller Mittelpunkt des Himalaya mit beeindruckenden kulturellen Sehenswürdigkeiten. Viele Reisende stürmen durch die Highlights der Stadt, aber Sie werden jeden Standort auf dieser landschaftlich reizvollen und ganz persönlichen privaten Wanderung erkunden. Besuchen Sie die ikonische Hängebrücke der Stadt und werfen Sie einen ersten Blick auf die berühmte Ganga Aarti-Zeremonie, während Sie einen Einblick in den Hindu-Glauben erhalten. Took us to parts of Rishikesh we probably wouldn't have made it to otherwise, and our guide was friendly, personable, and excited to be with us. 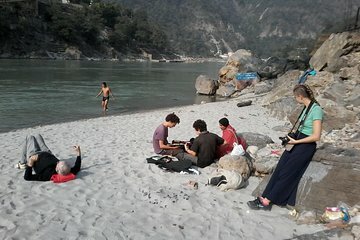 I took a 1/2 day walking tour to get oriented in Rishikesh very much a walking city. The day in question was a Super Full Blue Moon Eclipse! - a truly rare Lunar event, and significant in the Tantric Hindu calendar. Therefore many of the temple and Ashram offerings were unscheduled. But we improvised. Sunny is very knowledgeable on everything from best eateries to navigating your way, and also a genuine understanding of Yogic philosophy The Mahabharata, The Bhagavad Gita, the history of Uttarakhand, so on. We walked far, enjoyed a great lunch, went to the beach, I washed my feet head and face in Mother Ganga, and still made time for an earlier than usual Arti offering at Parmarth Niketan Ashram. A full day of wonder passed neatly into 6 hours. Not to mention, Sunny himself is a great character, good company, and one day hes gonna be a Star of wilderness tourism and TV. Make sure you tip these guys, they travel long distances to do their work and support their families. Rishikesh is small but an Indian town may still be overwhelming to a foreigner. Alpesh knew all the street shortcuts, ashrams and stores, plus he had very interesting information on all of India and it's political and religious history. We stopped whenever I wanted and he adapted the tour to my interests, including the pick up and drop off spots, he helped me negotiate the prices in the shops and even helped me carry my purchases. He took plenty of photographs with my cellphone and contrary to many other guides, he studied photography and took really good pics! I definitely recommend for anyone traveling to Rishikesh for the first time. This tour was amazing! Mr. Alpesh was our guide, and we spent a whole afternoon walking through the city and talking about Indian culture. He was very kind and attentive. The climax of the tour was the Aarti Cerimony...but we keep together up to the dinner!